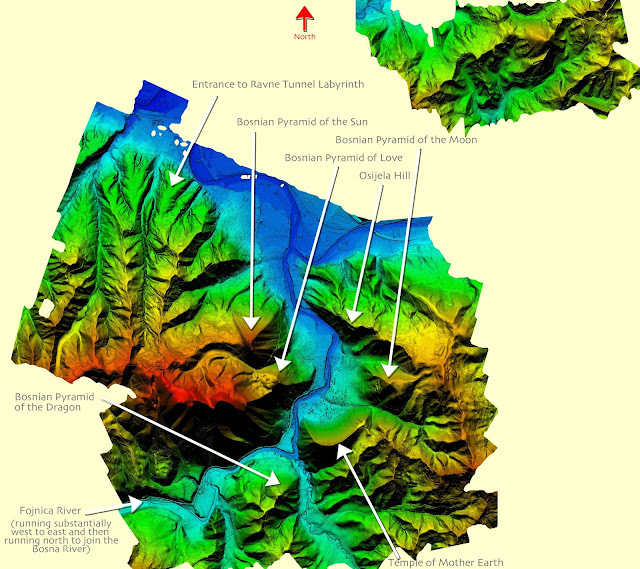 In March 2015, a LIDAR satellite scan was made of the Bosnian Valley of the Pyramids in the Visoko, Bosnia area. LIDAR ("light-radar") scans provide a detailed topographical picture of the area scanned. The first LIDAR scan image of the Visoko area, finally available as of July 6, 2016, shows clear evidence of gargantuan ancient artificial structures throughout the Visoko, Bosnia area. The visibly predominant features of these ancient structures are smooth pyramidal, and other, faces oriented to the cosmic north (or "true north" or "geodetic north"). (and joining it structurally) is the Bosnian Pyramid of Love. copious scientific evidence of an ancient pyramid complex centered in Visoko, Bosnia. Because a 2015 LIDAR scan data has provided solid -- indeed irrefutable -- evidence of gargantuan and truly ancient structures in Visoko, Bosnia, the final nail has been hammered into the coffin of Bosnian Pyramids detractors. 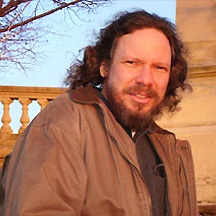 In his November 10, 2006 letter to Science magazine, Dr. Robert Schoch maligned the Archaeological Park Bosnian NGO Foundation, stating that "fossils are being ignored and destroyed during the 'excavations,' as crews work to shape the natural hills into crude semblances of the Mayan-style step pyramids with which Osmanagic is so enamored." Since pyramids have indeed existed in Bosnia since ancient times, and since volunteers and employees of Archaeological Park Foundation have been faithfully excavating these structures, and NOT creating modern-day step-pyramids, Dr. Schoch is in fact on record for ten years of libel. Hawass has since been discredited -- and is actually on the run -- for allegedly stealing billions of dollars worth of Egyptian antiquities and possibly other crimes. What was Hawass's reaction when he heard of Dr. Omanagich's claim that pyramids existed in Bosnia? He called a meeting of Egyptian officials to discuss possible negative ramifications to the Egyptian tourist industry. From the point of view of scientists and others endeavoring to discover the truth about humanity's past, the absurdity of such a reaction -- "How will our tourist dollars be affected if pyramids are found in Bosnia?" -- is almost impossible to put into words. In Archaeology's July/August 2006 issue, for instance, non-expert Beth Kampschror writes in her article, "Pyramid Scheme," that "the only people in the Balkans at that time [in which Dr. Osmanagich claimed the pyramids were built] were stone-tool-wielding Paleolithic people who never built a house, much less a pyramid." 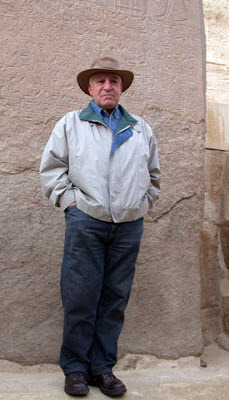 In his June 27, 2006 article, "More on Bosnian 'Pyramids,'" Archaeology magazine online editor Mark Rose writes that Zahi Hawass "concludes that, 'Mr. Osmanic's theories are purely hallucinations on his part, with no scientific backing.'" The only mention of Bosnian Archaeology after 2006 in Archaeology magazine is a two-line mention (and slander of Dr. Osmanagich) in October 2008: "Businessman Semir Osmanagic continues to dig up Visoko, Bosnia and Herzegovina, in search of pyramids, 'despite ridicule.' University of Sarajevo archaeologist Enver Imamovic likens Osmanagic's project to 'letting me . . . perform surgery.'" It cannot be asserted that Archaeology magazine editors were not aware of the continuous stream of scientific information emerging from the excavation and study of Bosnian Pyramid Complex since mid-2005. On October 16, 2011, I emailed a detailed a letter to the Editor of Archaeology, the full text of which is here (in a blog titled, "Letter to the Editor of Archaeology Magazine"). Did you know that a giant stone sphere (the largest ever found) was discovered in 2015 near Zavidovici, Bosnia in Dr. Osmanagich's Stone Spheres Park (or Stone Balls Park)? You wouldn't know this fact if Archaeology magazine were your only source for information about archaeological finds on planet Earth. Why is it, do you think, that Archaeology magazine, the most prominent archaeology magazine in the world, has completely ignored the discovery of the largest stone sphere in the world? Could there be some ideological (or other) agenda at Archaeology magazine that we're not aware of? If so, what is this anti-scientific agenda, and who is responsible for it? 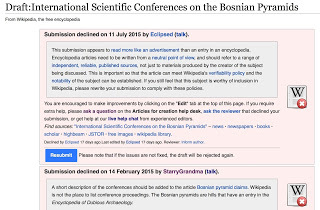 For three months in the winter of 2015, at the behest of Dr. Osmanagich, I gathered information for a Wikipedia article titled, "International Scientific Conferences on the Bosnian Pyramids." I edited the article and re-submitted it twice, but it was immediately rejected both times without any of the issues I brought up being addressed by any of the Wikipedia editors who "weighed in" (sent form letters to me) on the article. Bosnian Pyramid Claims: Excerpt: "[Claims of pyramids in Bosnia are a] cruel hoax." Now that the world has been offered conclusive -- indeed, irrefutable -- evidence of gigantic ancient pyramidal and other structures in the Visoko, Bosnia area (in addition to copious additional scientific evidence gathered over the period of 10+ years by Dr. Sam Osmanagich and scores of scientists and thousands of eager international volunteers working on the most active archaeological project in the world) . . .
4. Will Wikipedia editors apologize for ignoring plain science for ten years and for libeling and demonizing Dr. Osmanagich? Will Wikipedia editors publish articles on Bosnian Pyramid science and the copious scientific conferences that have been held in Visoko and Sarajevo, Bosnia? Will the Bosnian Pyramids mega-discovery be recognized and honored by Wikipedia as perhaps the greatest archaeological discovery of this century? Will Wikipedia editors allow real science to enter the hallowed halls of its heavily controlled pages on ancient history, or will the truth about humanity's past continue to be suppressed? It is the archaeological (and anthropological) orthodoxy's move. A conspiracy of ridicule against the Bosnian Pyramids Project -- a conspiracy that spanned 2005 and 2006 -- turned into a conspiracy of silence after it became clear that Dr. Osmanagich had indeed unveiled a great mystery in Europe. "The Mysterious Anti-Scientific Agenda of Robert Schoch: Part 1 - The Bosnian Pyramid Complex"
"The Cahokia Pyramids of Illinois and the Seven Deadly Sins of the Archaeological Orthodoxy"
"The Mysterious Anti-Scientific Agenda of Robert Schoch: Part 2 - The Yonaguni Monument 与那国記念碑"
"Like all sciences, archaeology is split into two main groups: 1) the orthodoxy, who focus on what they stand to gain from the scientific status quo (these are primarily academics) and 2) the scientists, who focus on discovery according to the dictates of the scientific method. . . ."
Author, "The Mysterious Anti-Scientific Agenda of Robert Schoch"